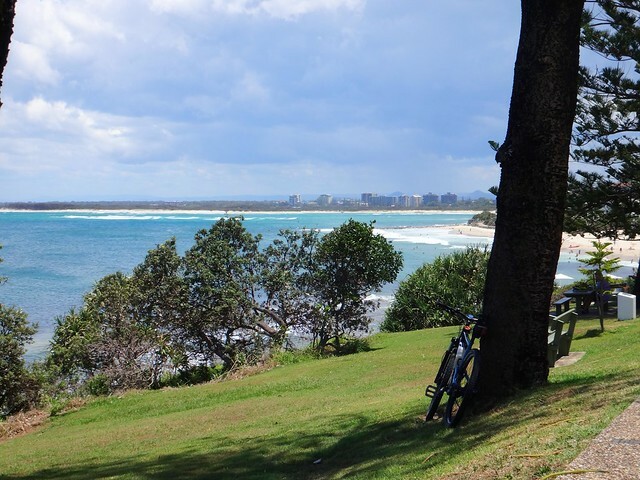 I’ve got pretty close to Caloundra on some of my previous rides, but never quite made it there for one reason or another. 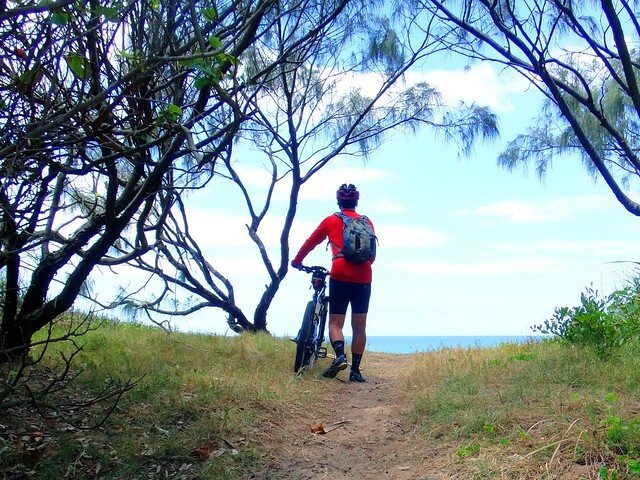 The challenging part for a mountain biker is the busy traffic between the beaches of Caloundra and the quiet trails to the west. 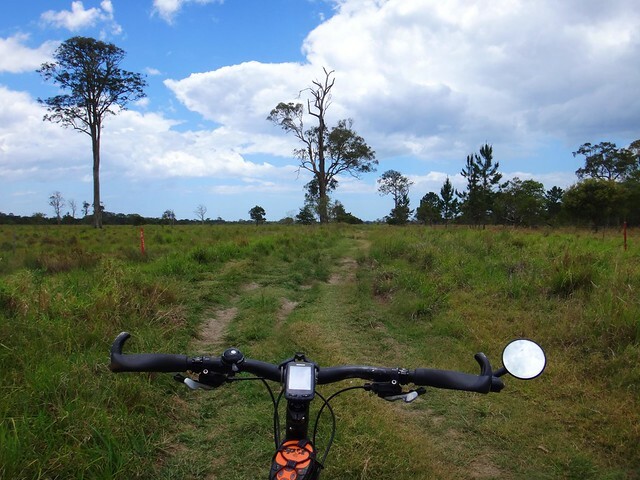 I’m unable to ride rough trails while I recover from injury, so today’s mission was to try fnd a quiet off-road route between Landsborough and Caloundra. I started from Ewen Maddock Dam. 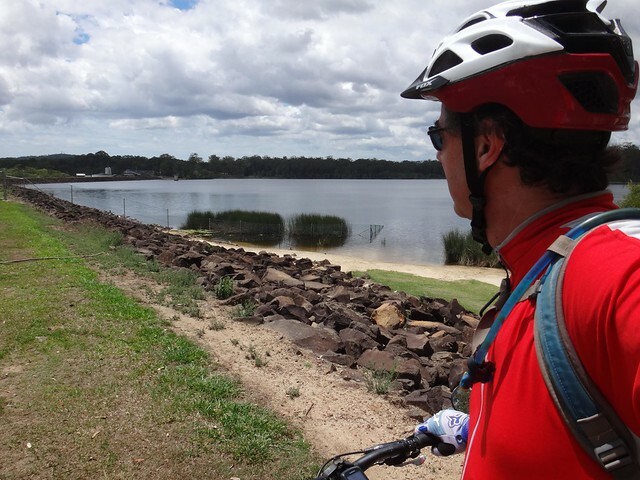 I’ve enjoyed many of the trails around the dam in the past, as well as some of the cross-country options through here to the Glass House Mountains, and back up into rainforests of Dullarcha National Park. Today’s ride would be towards the coast, so I had little option but to follow the main road for a short way. 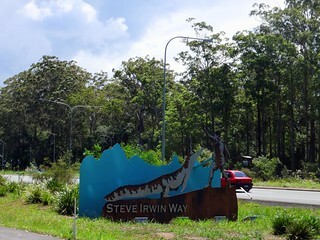 The road shoulder on this part of Steve Irwin way is nice and wide, so I didn’t have any problems with the passing traffic. Before crossing the highway I took a small detour along a quiet path in the Jowarra Section of Mooloolah River National Park. 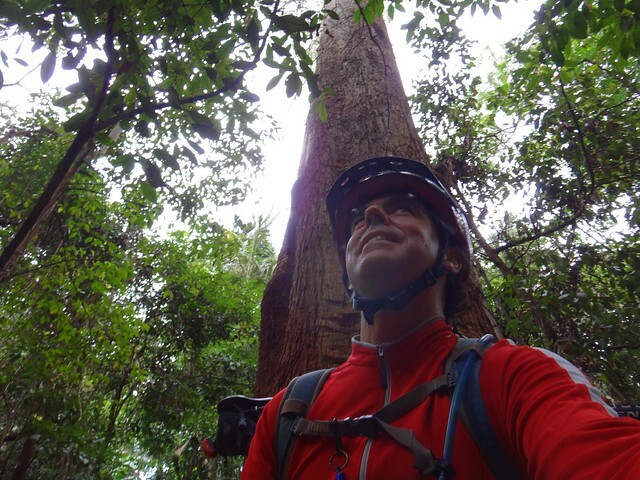 This small rainforest is on the banks of the Mooloolah River with some quiet tracks winding through the strangler figs, ferns and melaleucas. It has about 2km of well-maintained tracks, picnic tables and a nearby shop. If you’re ever passing by it’s well worth a look. 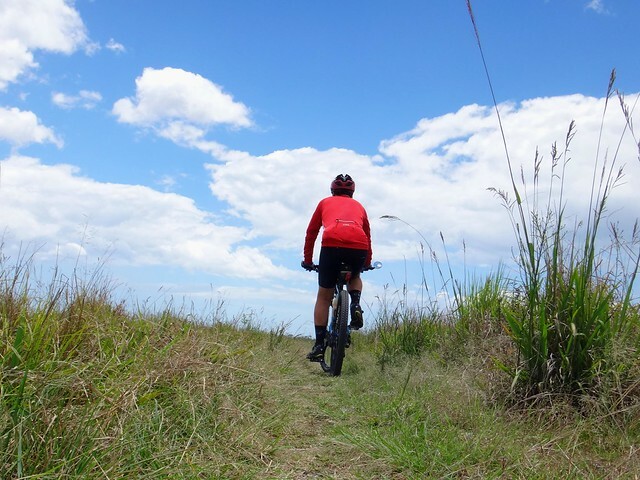 I had a grin from ear to ear as I pedalled through the fields of Meridan Plains. This was perfect. A couple of huge black cockatoos leapt out of a tree in surprise as I rolled by. “Hello brothers!” I yelled out happily. These gentle birds have a soft call that I love. They always seem to turn up when I’m having a good time in the bush, so I always associate them with delight and happy times. 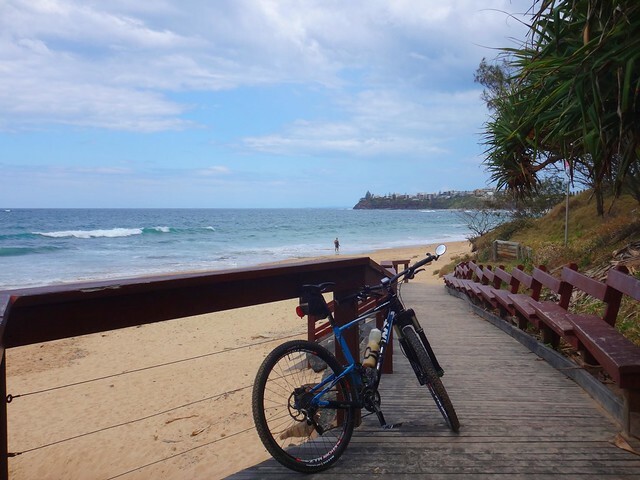 For any mountain bikers looking for a quiet off-road way to get from Steve Irwin Way to Caloundra, I’d thoroughly recommend Sattler Road. 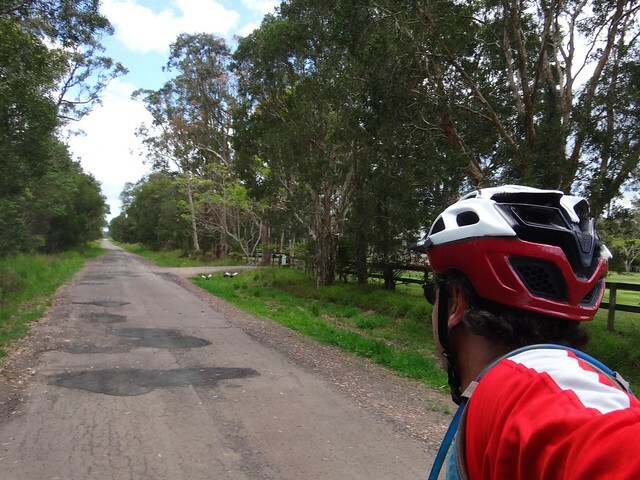 The flat terrain makes for an easy ride, but it also has the disadvantage of flooding easily. It’s probably best not to attempt it after heavy rain as I think this ground would be heartbreaking when muddy. 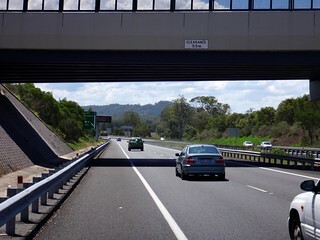 After another couple of kilometres of quiet back streets I eventually met up with this bikeway which passes under the Sunshine Motorway towards the Meridan State College. 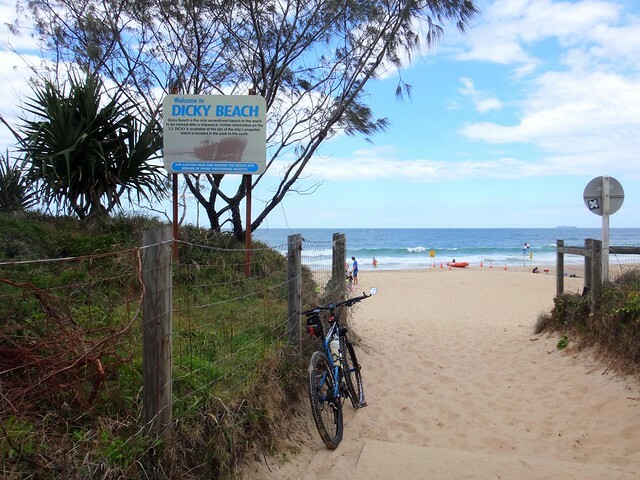 It was now a pretty easy ride on bike lanes to Dicky Beach. There have been a couple of shipwrecks in this area. The iron steam boat, S S Dicky ran aground here during a heavy storm in 1893. It has been there ever since. As a kid in the 1970’s I remember playing amongst the rusty remains. It seemed much larger then. Today, all I could make out was one bit of reddish metal poking out above the waves. The sea appears to be winning a long battle of attrition with the ship. Riding up Queen of Colonies Parade, I passed another chilhood haunt. As a kid we used to share a beach house with a couple of other families. 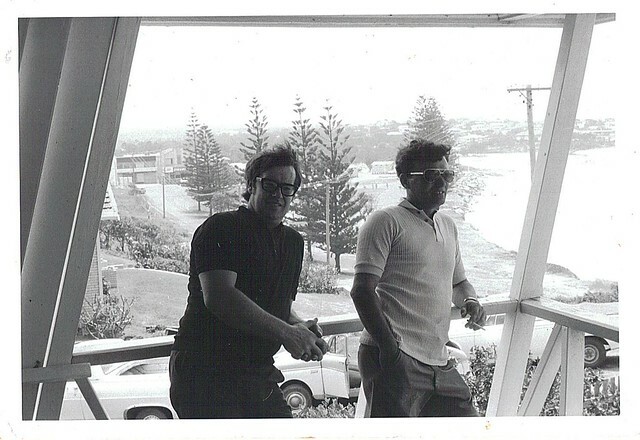 Named “Bimbo”, the house had million dollar northward views from the headland looking up towards Noosa. Those priceless views are probably the main reason “Bimbo” is no longer there today. The street is named after another shipwreck. The “Queen of Colonies” ran aground on this headland in 1863. The survivors were marooned for a couple of weeks living on shellfish and berries. One of the sailors carved the name of the ship on the trunk of a pandanus tree, which enabled resuers to eventually find them. 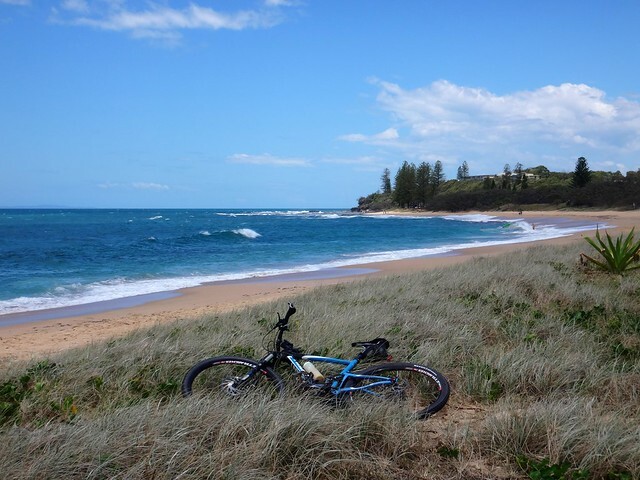 Shelly Beach is just round the corner from the headland. 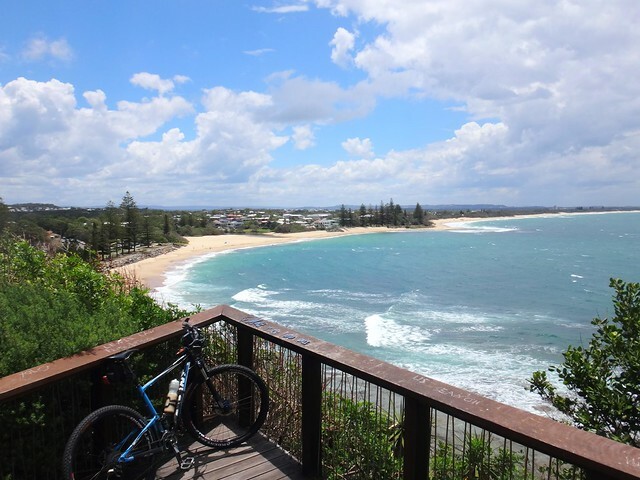 With rocky cliffs at either end, I think this secluded stretch of coast is the gem of all of Caloundra’s beaches. It’s quiet, unspoilt and gorgeous. The perfect place to chill out among the dunes. 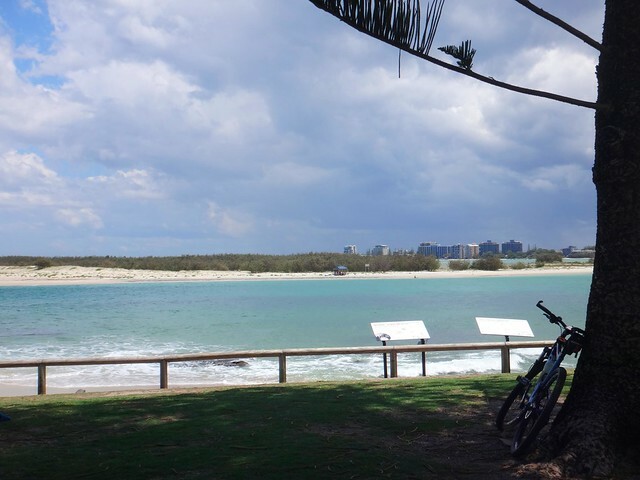 As I rounded the southern headland, I had a great view of the surf rolling into Bribie Passage and Kings Beach. The Moreton Bay shipping lanes come in very close to shore here, so the clifftop seats are a perfect spot for ship-watching as the ocean-bound behemoths slowly change course and head seaward. “Oh great – my handle bars are loose and need tightening” he said as he wiggled them back and forth. “My mates make fun of all the crap I carry in my bag”, I said as I tightened the handlebars. “Times like this I’m glad I do”, I added. The coolest thing about these single-speed bikes? A stubby holder on the top tube! 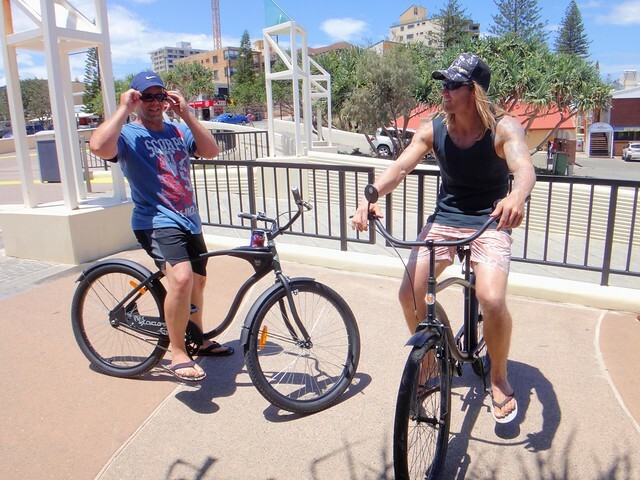 Drop a can of your favourite drink in the holder, get your rubber footwear on, and cruise the beachside paths. Awesome! I followed a skater and a cyclist along the boardwalk from Kings to Bullcock Beach. The skater had a horn that he honked at unwary pedestrians like a circus clown. I rode in his wake, as the pedestrians got out of his way. The pedestrians seemed to prefer being honked at by a skater, rather than me ringing my bell. Strange. 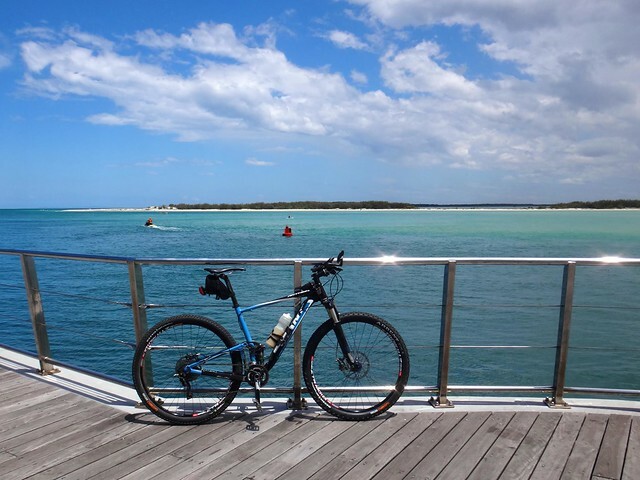 I couldn’t resist taking a quick pic of the spot that Murray and I stood at on Bribie Island during our fat bike adventure a couple of weeks ago. It’s amazing how close these two spots are, but how “far apart” they are from a cycling perspective. I think one day I’ll paddle across this section of water at slack tide, just to close the 100m gap in my map. At the western end of the boardwalk on Bullcock Beach, I took one last look back at the water before heading back along the main road to my starting point. 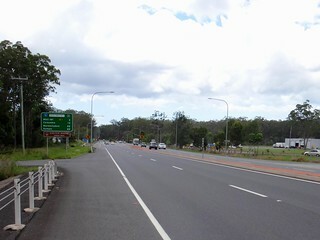 Caloundra is a beautiful part of the world. It seems much more relaxed than some of the more developed sea-side cities to its immediate north, and it has some gorgeous views. 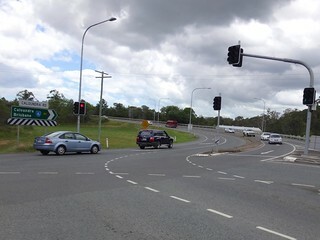 After a bit of a climb up “Little Mountain” I followed the wide road shoulder back to my starting point, waving some furious hand signals as I went through the intersection at the Bruce Highway, to make drivers saw me. It looks comical, but instead of sticking my arm out to the right, in heavy traffic I stick it out and flap it wildly so motorists behind me can see me more easily. They probably think I’m crazy, or pretending to be a bird, but I’d rather be crazy, visible and alive than respectable, invisible and dead. This ride was about 45km with about 400m of climbing. It took me Three and a half hours during which I burned about 1,600 kcal. 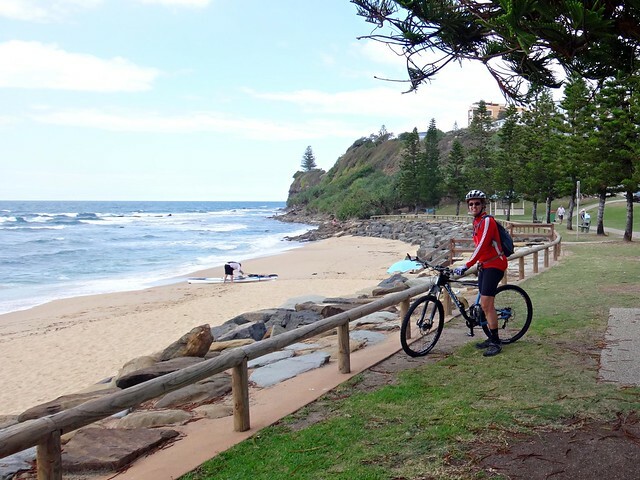 Apart from short sections of busy traffic, it’s an easy laid-back ride with spectacular views of the ocean. 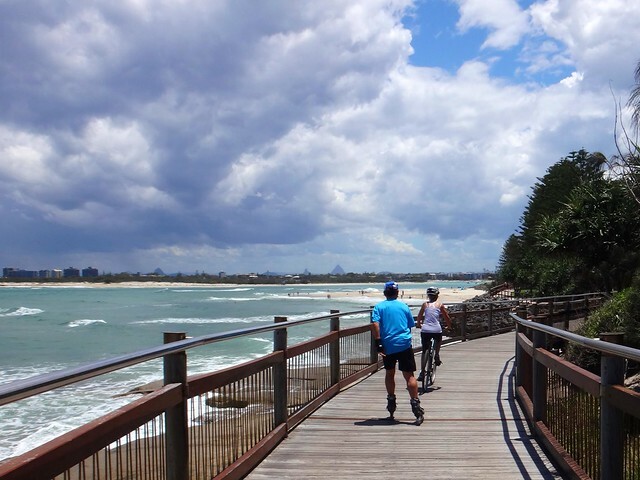 If you’re vacationing at Caloundra, I’d thoroughly recommend the coastal bikepath / board walk between Dicky Beach and Bullcock Beach. I’ll rate it 5.5 out of 10 on the tough-o-meter. Thanks Kenny. QOC was ok – it wasn’t too long. Little Mountain was harder because it was at the end of the ride and a bit longer. Keep an eye out on the MTB dirt forums and I’ll try and organize a social ride that’s a bit less demanding in the next month or two. did you know about the First Nation rock carvings just below the board walk at the main beach at kalowndra ? 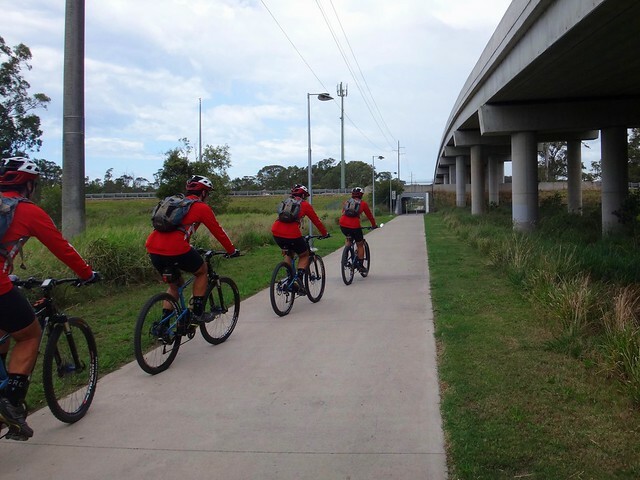 i don’t have any more info other than seeing it on the news one night, good to see you riding with a few spare Neils on the bikepath ..
Hi Jason. I wish I’d known that before we went back there today. I took the family for a walk along that boardwalk this afternoon. Great stuff Neil. 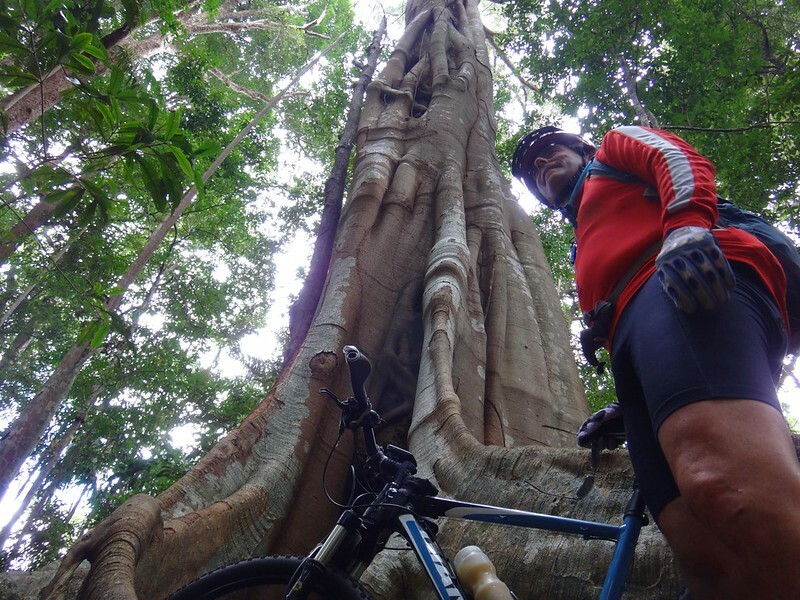 I always enjoy your blog posts being an ex-Brissie MTB’er now living interstate. It’s a pity that the rainforest you enjoyed is most likely going to be swallowed up by a new spaghetti junction though. Really disturbing stuff that such an incredible remnant forest with 200 year old habitat trees can just be bulldozed like it’s nothing. That’s bad news about the forest. Is this definitely happening, or do you think we would have a chance of saving it?